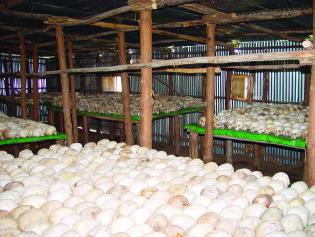 Bernard Kayumba, the mayor of Karongi district in western Rwanda, remembers just what it was like to be caught up in the genocide that claimed the lives of almost one million people in 100 days 19 years ago. A report by the United Nations Joint Human Rights Office has slammed the government and security forces in the Democratic Republic of Congo, condemning electoral violence linked to the Nov. 30 elections which led to at least 33 deaths in the capital, Kinshasa. The International Criminal Court delivered its first verdict Wednesday: Thomas Lubanga Dyilo was found guilty of recruiting children under the age of 15 to fight in a militia group in the eastern Democratic Republic of Congo. Five-year-old Vianey hasn't seen his parents since a series of explosions ripped through an ammunition dump in Brazzaville on Mar. 4. A stranger, Jules Bomboko, said he found Vianey days later, wandering around the Tréchot neighbourhood, a few hundred metres from the site of the blasts. The outlook for people living with disabilities in the Democratic Republic of Congo remains bleak, despite a variety of efforts to improve their lot and bring them in from the margins of society. Governments and civil society organisations in Central Africa are slowly developing strategies in response to global warming. But specialists say the steps being taken seem hesitant in the face of emerging realities. Fears of violent demonstrations against the provisional results of the presidential elections - released on Dec. 9 by the electoral commission - have given way to terror in Kinshasa, the capital of the Democratic Republic of Congo, which has crackled with the sound of gunshots and the firing of tear gas canisters since Friday afternoon. They should be wary of each other. The historical conflict between their ethnicities has resulted in Africa’s largest genocide. The adoption of international guidelines to regulate so-called land grabs has been pushed to next year after negotiators failed to agree on conditions for large-scale land investments and enforcement.